By now you probably know that the best social media strategies engage users 80% of the time with content that informs, entertains and interacts. Within that 80%, a majority of your posts should fall into the “interact” category. A great way to fill your social media calendar with posts that foster conversation and meaningful interaction is by leveraging user generated content (UGC). Sounds promising, but what is it? UGC is content created by your fans and followers that you share and repost on your own social media channels. For example, do you remember those Facebook videos of people dumping buckets of ice water on their heads? In 2014, the ALS Foundation launched one of the most successful UGC campaigns to bring greater awareness to their organization. They simply asked followers to share a video of themselves accepting the #IceBucketChallenge and challenge friends and family by tagging them in the post. The campaign went viral, earning $100 million in donations and millions of new donors. 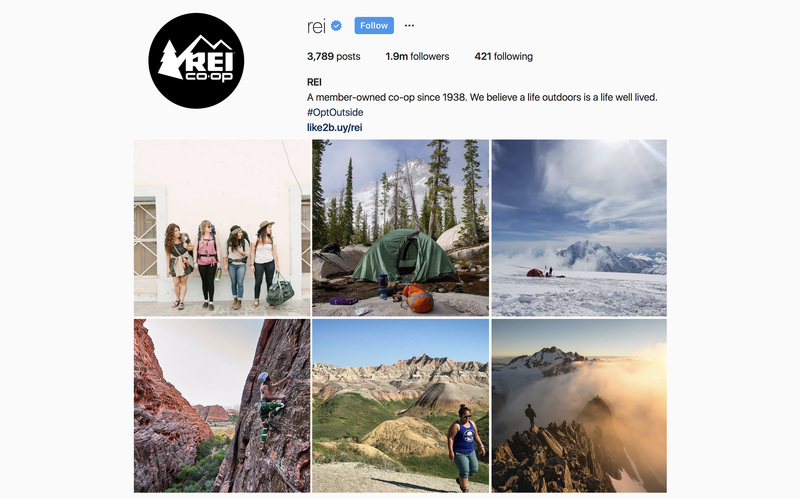 Another example of a successful UGC campaign is REI’s Instagram. All of their posts show real people living life outdoors, and the majority of them are from REI followers. Filling their feed with UGC gives the outdoor company the authenticity that people crave (85% of consumers believe user-content is more influential than branded). REI has built a community that’s 1.9 million strong by connecting with and celebrating their fans. Is user generated content right for my brand? And it’s okay if it’s not. UGC works best for brands that sell products, services and/or experiences that people would want to share on their social media accounts. If sharing UGC feels forced for your brand, then there are plenty of other strategies you can pursue to interact with your followers (examples include: polling, responding to comments, collecting opinions, asking for feedback, etc.). The key here is to make sure the content you share is truly authentic and fits with your brand’s values. Building a library of user content can take time and persistence, especially if you haven’t shown a lot of love to your social community. That said, collecting UGC isn’t rocket science, and you don’t have to have 87.3 million followers like National Geographic. If people are wearing a brand while doing an activity, 99% of the time they will include a brand-related hashtag in their post about it. Take this inspiring Instagram post from @skuzmic20, who used not one, but four Nike-related hashtags. (Three points if you can name them all.) Hashtags are a great way to find UGC. Instagram and Twitter are hashtag heavy channels, so use their search bars to explore hashtags related to your brand and the people using them. If you’ve found very little user generated content after searching hashtags and locations, don’t throw in the towel. Use it to dab the sweat from your brow, and then fashion it into some pom-poms, because it’s time to start cheerleading your fans. Get them excited to share their stories by rallying them around a shared cause. For example, Aerie aggregated hundreds of thousands of photo submissions after inviting fans to celebrate body-positivity with their #AerieReal campaign. People also like sharing the simple joys, like Starbucks’ #MacchiatoMondays. Whichever campaign angle you take, make it easy for users to participate by creating a unique, brand-relevant hashtag. We know from experience that right contest or challenge can also generate UGC. In 2016, we used a challenge to help the Novant Health Charlotte Marathon generate buzz for the rebranded race and build a team of brand ambassadors. To kickoff the application for the ambassador program, we posed the following question on the Charlotte Marathon’s social media accounts: “How will you make the Charlotte Marathon your own?” and challenged interested runners to post a selfie with their answers. There were an overwhelming number of responses, and…drum roll please… the campaign was used again (and grew!) in 2017 and 2018. There are a few ground rules to make sure that UGC is fun for everyone. First, always ask permission before sharing someone else’s content. You can do this with a comment like, “We love this photo. With your permission, we’d like to share it with our followers. If you agree, please reply with ‘Yes!’” Giving the user credit for their photo is a nice touch and also lets your other followers know you’re looking for UGC. If you ask fans to share their content with you, don’t leave them hanging! You should like and comment on their posts to let followers know you’re really listening, even if you don’t decide to share it on your own accounts at that time. This isn’t speed dating; you want to set long-term relationship goals with your fans to earn their engagement and UGC. Finally, only select UGC that supports your social strategy. If you’ve been mentioned in a photo that doesn’t match your brand identity, simply thank the user for being a loyal customer and for sharing their positive experience. Have you tried a UGC campaign before, and did it work for you? What brands can you think of that have successfully leverage user content? » Want to keep the conversation going? We love social media and want to talk more about how we can help your strategy. Drop us a line!